Happy Friday to ya, Floralpreneurs! I’m really proud to sponsor the most recent episode of the Botanical Brouhaha Podcast and if you haven’t checked it out yet, I HIGHLY ENCOURAGE YOU TO LISTEN TO THIS TODAY! 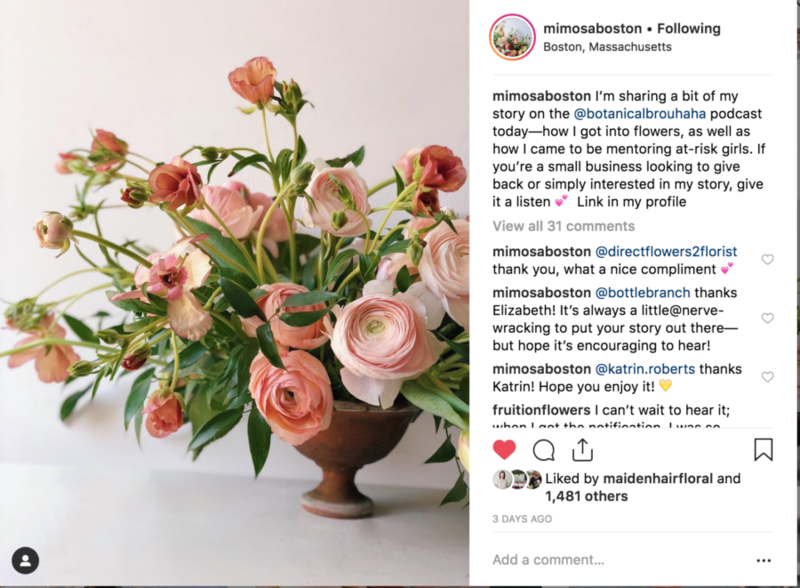 It’s always inspiring and interesting to hear from florists who’ve “made it” in their biz…..whether they’re recognized in nationwide publications or featured on your favorite blog or globetrotting to distant lands for luxury events, but this particular episode with Teresa Fung of Mimosa Boston is about so much more than “making it in business”…..
Hitomi Gilliam often talks about the concept of “flowers with purpose” and if you’re someone who prioritizes giving back in your business (and life) or if you’ve been longing to find a “higher purpose” for your floral design work, then, prepare to be inspired. CLICK HERE TO LISTEN! Teresa has turned her talent for floral design into a tremendous gift of mentoring and career building skills….there’s so much purpose in this designer’s mission. I believe in building giving into my growth strategy. For example, I donate meals to the Vermont Foodbank for every wedding I book, and in November I donated 10% of my profits from my courses and templates to American Red Cross California Wildfires, Charity Water and Rainforest Alliance), but Teresa’s commitment to using floral design for a higher purpose is about giving more than money….it’s about sharing knowledge and teaching valuable skills to at-risk girls who deserve a chance to level-up. I think she’s a wonderful example of how we can always aim higher in our businesses and we can always “do better”. And make sure you check out the BB Garden Style Initiative here. You can even make a donation while you’re there!